The M82 irregular galaxy is located in the constellation of Ursa Major, 12 million light-years from Earth. With its neighbour, the M81 spiral galaxy, it forms a most beautiful pair of galaxies. It can be seen as an elongated cigar shape using a small telescope (its magnitude is 8.4). 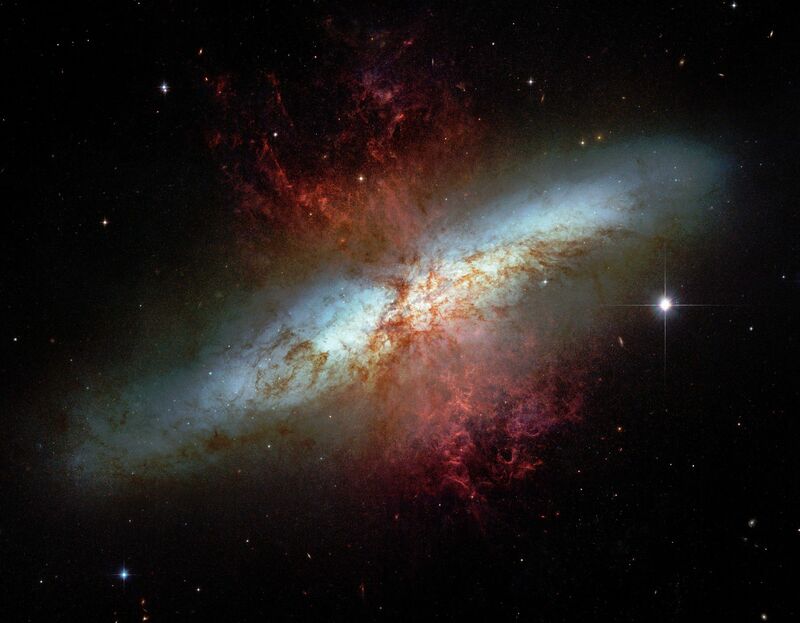 M82 has a very tormented nucleus with dark bands that can be observed using a slightly larger telescope. These irregularities are the remains of gravitational disturbances caused by its neighbour M81 as they approached each other a few hundred million years ago. Since then, stellar activity in the galaxy has been very intense and results in strong radio emissions and an excess of infrared, making it the brightest galaxy in the sky at that wavelength. Two intermediate black holes were detected for the first time by the Chandra telescope in the X-ray spectrum at the heart of the galaxy. They are too big to be stellar black holes and too small to be supermassive black holes, they co-exist with a black hole of several million solar masses.